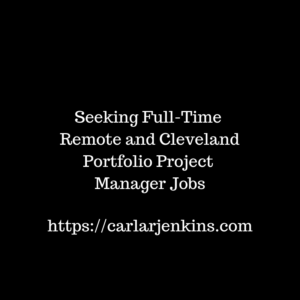 I am looking for full-time remote and Cleveland direct hire and temp-to-hire Portfolio Project Manager positions. I have spent 12 years’ solving complex problems using agile project management in both the private and public sections. In addition, I have managed projects for small, medium and large businesses. Finally, I have Project Management Professional (PMP), Certified Scrum Master (CSM) and ITIL Foundation licenses. I look forward to being a part of your team. Thanks for the opportunity.